The Meddlesome Priest is the story of a 20th century Australian nationalist who became a legend. Ernest Burgmann experienced the Great Depression and the wounds it left on Australian society as a young Anglican priest in the Hunter Valley (NSW). During the 1930s and 1940s, he became known as an outspoken radical, a maverick within a conservative church and society. He and many others were surprised when he was elected Bishop of Goulburn in 1934, a country diocese which included the still small city of Canberra. He was nicknamed the ‘Red Bishop’ because he refused to share the anti-soviet paranoia which gripped most Australians. He was credited with helping to defeat the Menzies’ referendum to outlaw the communist party and later joined with others in calling for Australia to keep out of Indo-China politics. He worked in Paris with HV Evatt on the United Nations’ Universal declaration of Human Rights. He was a frequent campaigner in the newspapers, on public platforms and the radio, urging governments to do more for the unemployed, to service country people with water and electricity, and to rid the cities of slums. Ernest Burgmann was an outspoken champion of individual civil rights whose radicalism sprang from a deeply rooted working-class love of the people and the land. He was driven by his faith to challenge the conservative complacency of Australia and his actions had a profound and far-reaching impact on Australians well beyond the boundaries of his diocese. Burgmann’s words and actions hold a promise of extraordinary relevance to Australian society today. The family uniformly remember (the move to Morpeth) as a Golden Age. Photographs show the children in bare feet and old clothes, with the vast estate theirs for the taking. Victor recalled a heedless childhood, undisciplined and largely unsupervised. The girls described a more protective environment but spacious and stimulating. They felt privileged in their easy access to their father, for he was always there, unlike ‘ordinary’ Dads. Lessons about religion and personal relationships were absorbed through conversation and exampleâ€¦ Victor could remember no special prominence given to one or other of the commandments, no particular taboos, ‘but the teaching I do remember’ he said about his father ‘is that if you don’t agree with me come and let’s have a talk about it. Any decisions could be questioned’. Another strong influence on Victor in his years at the University was the Student Christian Movement of which he was an active member. It fitted in well with Dad’s influence in that it stressed that life was about seeking the truth by which to live and that no one denomination had a monopoly on that truth. I don’t think he had any paid work before CSIRO. During the early part of the war he was sent by CSIRO to work in London, liaising with British radar scientists. He departed eight days after his wedding on 27 July 1940 to Lorna Constance Bradbury, but Mum was not allowed to go with him, though she joined him about 15 months later. He kept a journal during this time about bomb damage during the blitz and wrote lots of letters to Mum, which I have. He reckoned the safest accommodation was the fifth floor of a nine-story building, so that is where they rented a flat. He was then sent to Washington to the Pentagon and also to Boston. My brother Jon was born in Washington on 1 October 1942. It was an interesting moment when I connected it to the mains for the first time and switched it on, hoping I wouldn’t destroy the first ASV set in the southern hemisphere. I pointed a makeshift aerial out the window and the set worked. Soon after, Victor and a technician from the Post Master General’s Department installed the equipment in a DC3 from the RAAF base at Richmond near Sydney and had the pilot fly them out over the ocean. There, in an exciting experiment, they received the first echoes from a real target, a merchant ship steaming off the coast. At the Radiophysics laboratory he was promoted to Principal Research Officer in 1945-49 and was awarded the Bronze Medal of the Institute of Navigation in 1951. A more detailed account of CSIRO’s research during World War II can be found at Radar. Soon after the end of World War II the Radiophysics Division, which had been set up just to do work on radar, faced a real crisis. They had all of these highly trained young physicists but the radar research program was going to be shut down on the grounds that no one was really going to need it given the war was over. So the team put in a bid to the CSIR to get funding to remain a radiophysics research Division that would be concentrated in two different research areas. One was to be rain making and research on cloud seeding; the other was to be radio astronomy. In 1949, a third opportunity arose with the establishment of the three Wool Textile Research Laboratories, one of which (the Physics and Engineering Unit in Sydney) was to deal with textile physics with Victor Burgmann appointed Officer-in-Charge. The Unit was originally housed at the Division of Coal Research at North Ryde and moved with a total staff of 13 into ‘The Hermitage’ in Ryde when it was acquired by CSIRO in 1952. Burgmann was first made aware of the Ryde site by Norm Roberts, a radio engineer and early Textile Physics staff member who had lived since 1941, in ‘Wollondilly’ the house adjacent to ‘The Hermitage’. The ‘Hermitage’ building is classified by the National Trust and was built by John Blaxland (who was known as ‘the Hermit’) and was the son of the pioneer farmer and explorer, Gregory Blaxland. These laboratories became, respectively, the Divisions of Protein Chemistry, Textile Physics, and Textile Industry in 1958. In the early 1950s, the underlying thrust of the objective of CSIRO wool-textile research then ‘ as now ‘ was to tackle any technological weaknesses in the long chain of steps from the farm to the retail counter, and also to improve the attractiveness or marketability of the wool end-product to the ultimate consumer. There was also a strong belief that a better understanding of the complex chemical and physical structure of the wool fibre was fundamental to making progress in these two objectives. This meant that the nature of the research ranged from quite basic studies of fibre structure through to the development and proving of processes that could be easily adopted by industry. By its very nature, this chapter is concerned with the latter type of activity, and hence the excellent fundamental studies carried out receive scant mention. This should not be taken to indicate that they have had little influence. On the contrary, although no one individual study can be highlighted as being the ‘breakthrough that changed wool science’, collectively these studies have built up a picture of the chemical and physical structure and properties of the fibre which is essential for the research scientists and technologists of today and the future. The exciting possibilities, for example, that genetic engineering now offers for improving wool growth will be much more readily realised because of this work. Victor Burgmann was Officer-in-Charge of the Physics and Engineering Unit, Wool Textile Research Laboratory from 1949 to 1958 and when it was elevated to Divisional status, Foundation Chief of the Division of Textile Physics from 1958 to 1969. Details of the structure and physics research carried out at Ryde can be found in Vince Williams’ book From Fleece to Fabric ‘ Fifty Years of Wool Textile Research, 1948-1998. In March 1969, Victor Burgmann became an Associate Member of the Executive Committee of CSIRO and was made a full-time member the following year. When Sir Robert (Jerry) Price retired in 1977 after seven years as Chairman of CSIRO, Victor was appointed to succeed him. This was at the time of the Birch Independent Inquiry into CSIRO. 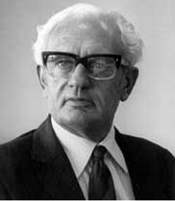 Victor remained Chairman until retiring in September 1978 when Paul Wild took over to implement the changes recommended by the Inquiry. He was created a Companion of the Order of the British Empire in January 1977 and was a member of the Farmers Club (London). He became a member of the Council of the National Library of Australia in 1977 and was its Deputy Chairman from 1982 to 1984. After retiring in 1979, Victor and his wife Lorna lived in London for a year, a place he was especially fond of, then returned to Canberra. In his retirement he became a keen and successful croquet player with the Canberra Croquet Club. In addition, he was interested in devising aids for disabled people to enable them to play a variety of sports, but unfortunately his illness prevented him continuing with this. He was diagnosed with Parkinson’s Disease in 1983, but continued playing croquet for another few years. He and Lorna moved to Sydney in March 1986, to the Cotswolds Retirement Village in North Turramurra, to be near their son Jon and two of their three daughters, Beverley and Meredith. By the late 1980s his condition had deteriorated considerably, due to the onset of a rare degenerative brain disease, called Diffuse Louis Body Syndrome. He died on 7 February 1991. He was a member of the Institution of Electrical Engineers, a British professional organisation of electronics, electrical, manufacturing and information technology professionals founded in 1871 as the ‘Society of Telegraph Engineers’. He was a Fellow of the Textile Institute, UK (FTI) and a Fellow of the Institution of Engineers Australia (FIE Australia). Bennet D, 2010, Personal communication (Dorothy is Victor’s sister). Burgmann V, Burgmann J, 2010, Personal communication (Verity and Jon are two of Victor’s children). Hempenstall P, 1993, ‘The Meddlesome Priest’, Allen & Unwin, St Leonard’s, NSW, Australia, pp411. McKay A, 1976, ‘Locating Aircraft’, In: Surprise and Enterprise, Fifty Years of Science for Australia, White F, Kimpton D (eds), CSIRO Publishing, pp.21-23. Taylor DS, 1988, ‘Australian Innovation in Textile Technology’ [external link], In: Technology in Australia 1788-1988, ATSE, published by Australian Science and Technology Heritage Centre, Chapter 5. Who’s Who in Australia, 1985. Williams VA, 1998, From Fleece to Fabric ‘ Fifty Years of Wool Textile Research, 1948-1998, CSIRO, Australia, 198 pages.